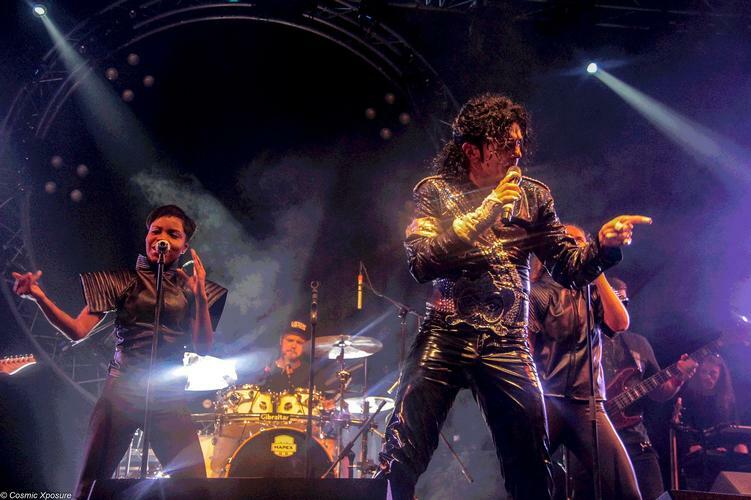 From dancing along to the legendary pop videos as a child, to playing to a crowd of weeping fans the day after Michael Jackson died, Ben Bowman is certainly dedicated to his life as the UK's ultimate Michael Jackson tribute artist. The show is a celebration of Michael Jackson's life and work as arguably one of the world's most influential entertainers. In 2019 Michael Starring Ben is already playing more than 40 theatres across the country. Michael Starring Ben is to get its West End premiere with an exclusive one-off performance at the legendary London Palladium, for one night only on Saturday, April 6. "Me and my brother grew up with my mother's vinyl collection and Michael Jackson was part of that. We especially caught on to him, and even started dressing up as him for fancy dress parties. I became one of those kids who learned all the dances from the videos. "When it comes to the singing, I was around 16 or 17 and my friend asked 'How does Michael Jackson's new song go?'. It was You Rock My World, I sang a couple of lines and she said I really sounded like him." "Fourteen years, I literally started straight out of school. I was at college, studying drama, and they told me I could earn £77 a night in the West End. So, I quit the course and said 'I can earn more than that as a Michael Jackson impersonator' and it went from there, I started booking venues. "Even when I started, I thought it was just something fun that I could do on the side of working. I never imagined I would be a full-time Michael Jackson impersonator – it's not like it's something that comes up at the job centre!" "There have been millions! So many amazing, funny things have happened on the road. "The first time we played to 20,000 people at a festival, I stepped out on stage and thought to myself this has got to be close to what Michael experienced. It was the most people I had seen in one place in my life, at that time. "Over the years, it's become so rewarding, especially since Michael passed away. It's rewarding to see what people take away from what we do. They don't just come and see a show, they come up after and say: 'I saw Michael live and that was fantastic, he would be happy at what you're doing.' It's wonderful people feel that about it, as that's what we feel about it. "It's a continuation of the legacy. What I love most is that it introduces kids to Michael Jackson too; young people who weren't even alive when he was alive. Kids who are not even four or five years old are huge fans, from their parents' influence. We get kids there in full costume, dancing and singing along to the Jackson 5 tracks. I'm like 'How is that, it's from 1972?'. It's insane. "His legacy will never disappear and hopefully we help keep that alive." It's clear you're as much of a fan as the people who come to see your shows. Is that an important part of doing the job? "I love Michael Jackson as much now as when I was five. I listen to his music every week still, away from performing. I can't imagine my life any other way. Everyone in the team are Michael Jackson fans, we do it because we love him. "One quote I always remember someone saying to me was 'I can tell that everything done in the show was done for the right reasons'. It's amazing that someone took that from it, that they have clicked into what I was doing." "After 14 years, I'm a very adept actor in the sense that people expect me to go off to a dark room to 'become' Michael Jackson. But it's not like that. My make up takes about 45 minutes, it used to be two hours but I have it down to a fine art now. I glue my hair on. I used my own hair until it started to get too thin, so I had it chopped off and now use a wig. I get into costume, then warm up my body and voice, as it's a real work out. Over all now, it's two hours but I can be done in an hour and a half. "Then I step out and go for it. It's wonderful. People say don't you get bored? Our set has been the same for four and a half years, but every audience, every venue is different and an adaptation. There are definitely worse jobs in the world." What's your favourite Michael Jackson era/image? "The first conscious image I remember as a child is the Bad era – and it's definitely my favourite. He had a cool, tough edge about him, and I've always loved that side. "A few years ago, they released the Bad tour on DVD for the first time. I had learned from seeing him at an older age, from the Dangerous and HIStory tours and that stuff is great, but he was in his mid- to late 30s. But when I saw Bad, I was like 'Back to the drawing board' – he was at his absolute peak in those concerts. Seeing that for the first time was 'Wow'. "Jackson was a massive perfectionist with his live work, he hated releasing it. He held off releasing Dangerous until about 2002-3 and that tour happened in 1992, and Bad was even later, after he died, and was released for an anniversary of the album. Seeing that rekindled, that feeling of how I felt about him in that era, how amazing he was. "Bad was also a crossover era as he wrote most of the songs on that album. Since he passed, they have found notes and notebooks from that time, with things like 'I will no longer be known as Michael Jackson of the Jackson 5'. He created that aura to make himself the biggest star on the planet. He was a terrific businessman. He was a self-manufactured pop star and got the public to play to his tune. And the Bad era was the when that started to happen – and he was creating the terms like 'King Of Pop'. "When I started out, I had a lot of trouble trying to recreate the album versions of his songs. They're studio works of art and you just can't recreate that live. Seeing the live footage, I can study the voice in the raw and for me, the live singing on Bad is the best." "Where has that time gone? I still remember hearing the news and having to go out the next night in a bar to perform. It was a big bar, and there were about 700 people crammed in, and people outside. It was insane. I'll never forget that night and the turn out – it would usually have been about 400 people and was almost doubled. People were crying, it was a very emotional night. "The fans are so passionate. The screamers and criers are my favourites. I absolutely love that we incite that reaction, it means we are doing something right. It's insane, incredible, that people are drawn into it for those two hours that we perform, that they believe in what we're doing. "It's quite an emotional experience for me too, as a Michael Jackson fan, to watch other fans react like that knowing the way they feel about him is the same way I do. It's very intense. It's a feeling I wouldn't swap for anything."